Like many artists, I sometimes 'see' things that aren't there. Or maybe they are. I don't know. Anyhow, of all those lurkers in my peripheral vision, the one that I get asked about most often is the great and terrible Stephen. So, here's his full story for you to...um...enjoy ? It all started with a song - the actual track by Alice Cooper is titled 'Steven' but I changed the spelling as otherwise there may have been a terrible temptation to address him as 'Steve' and I don't even want to think about what might happen then. Should you decide to dip a toe in the water, you can find it on YouTube along with 'Years Ago' which was another of his personal anthems. It's best listened to at good volume with your eyes closed, it's actually a fantastic piece of music once it gets going but it is very, very creepy. I'm still not sure where things like Stephen come from. When I'm working on them they are as real to me as the chair I'm sat in but whether that just means I'm barking, I have no idea. I find they tend to come around in the early hours when I'm alone. I like to have my headphones in to cut me off from the rest of the world so I'm not distracted. It's often as if there is a quality to the music I have on that attracts them in the same way that different aromas will draw in different animals. The first impression I got of Stephen was of something squatting with his hand against a wall or a door, as if to keep something else out. 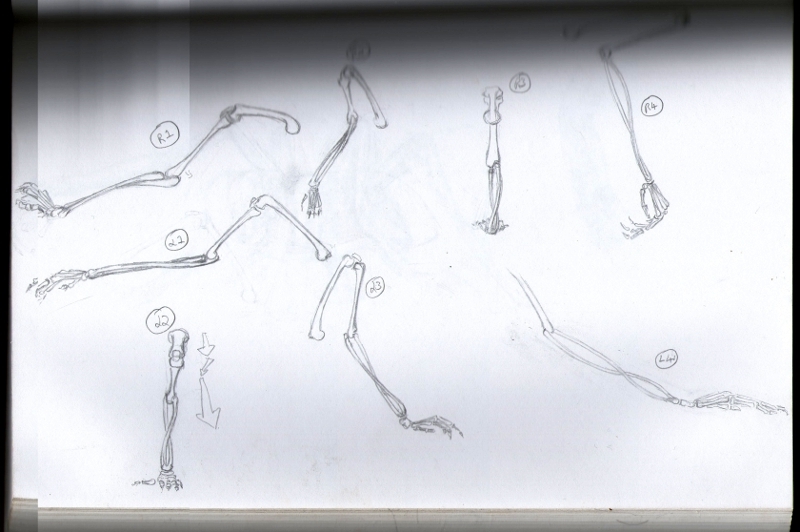 I drew more hands and arms thinking I was looking for the right posture when I realised they all belonged to the same thing. I still couldn't see how it all came together though. I tried adding a spider body but that wasn't right so for the next year or so I spent a lot of time experimenting with different arrangements in the hopes it would become clear. 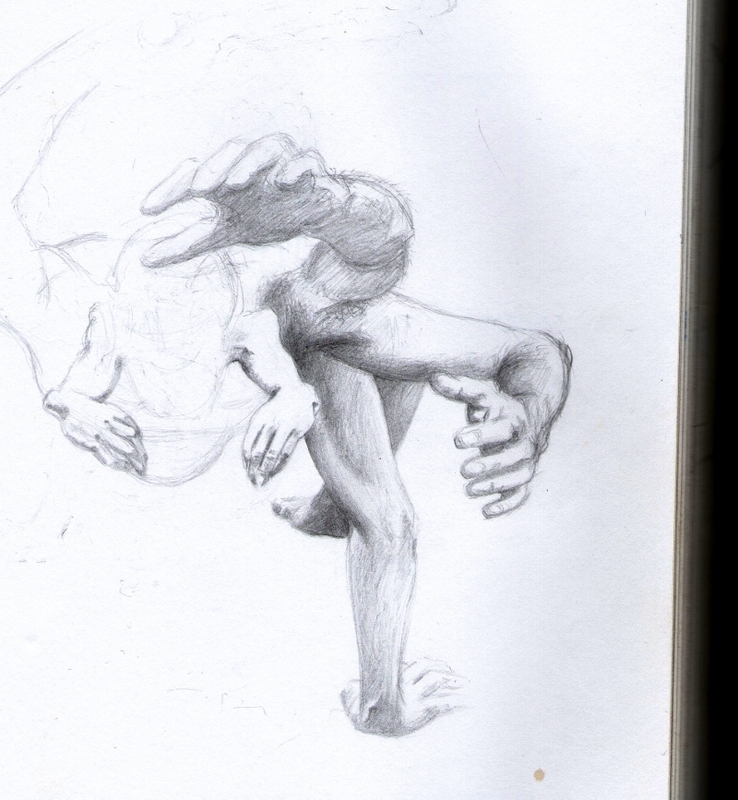 Stephen never really went away and I kept returning to my sketches, gradually pairing up arms and getting a sense of how he moved. A good couple of years after I'd first started work on him, I had what has to be the most disturbing nightmare I've ever had. He was in the house and started coming out of one of the cupboards, arms first. His limbs unfolded and extended which is when I first knew he had that extra joint in each one. I ran away but something made me go back, I think I wanted to make him leave but each time I found his hidey hole I would suddenly find myself standing outside the house in the dark. This happened again and again in different rooms and it became apparent that he was somehow in control, was making me lose time and keeping me away. When I woke, I was in a complete panic and Rich had to get up and search every inch of the house with me. Needless to say, it was a sleepless night after that. That whole experience did however give me most of the information I needed to start putting together a plan of his anatomy. I always test my initial sketches by working them from the bones up, to be sure I have them right. Only if the blueprint for want of a better word matches the proportions of my original drawings do I consider them to be true and go on to do a finished piece. His head was the last piece of the puzzle - for a long time I wasn't even sure he had one but as I got closer to a complete image, I could see him in my minds eye moving around and realised that his head was slung low, which is why his eyes are on the bottom half of his face. The picture you see on Pyewackett and Pecke of him side on is, to me, the single most important piece I have ever done. There will be other images of him in abandoned buildings but that particular drawing is when I was closest to him and he came all the way out into the light. It's also when most of my fear went away. Stephen is an odd one - we've learned to live with him but he's still unsettling. It would be strange without him though. I get the feeling he was maybe a person once but has been by himself for so long he's become confused, something else. Not a creature you could or would want to engage with but he's done us no harm so we just live around each other.